The Chindit Society's centre piece event to celebrate the 75th Anniversary of Operation Thursday, will take place on the weekend of the 22/23rd June 2019. This weekend will be hosted by the present day 77 Brigade at the Hermitage Barracks in Thatcham, Berkshire. We are planning a very full itinerary, starting with lunch on Saturday and with other activities going on right through to Sunday afternoon. An exhibition of Chindit related weapons and memorabilia (families are invited to contribute). 77 Brigade’s role in today’s British Army. Meet a real life mule. 2.30-3.30pm. A presentation by Tony Redding regarding Operation Thursday, followed by tea and cake. 4-6pm. Free period for guests to relax/dress for dinner, followed by a Drumhead Service with a military band and a group photograph. Followed by a veteran’s forum and other presentations (listen to our Chindits talk about their experiences in Burma). 1pm. Buffet lunch, accompanied by 1940’s themed music. 3pm. Depart Hermitage for home. It is very important that we are made aware of your intention to attend the June event. To book a place, please contact Paul Shenton via one of the following: Telephone: either 01736 711985 or 07974 688151. Email info@thechinditsociety.org.uk or write to Johns Corner House, Johns Corner, Rosudgeon, Penzance, Cornwall. TR20 9PJ. ​To search the site for a person or place, please use the search function box found in the top right hand corner of every page. This is very much an ongoing project, I have information on many individuals some of whom are not yet present on the website. If you cannot find the Chindit you are looking for, it may well be worth contacting me using the form at the foot of this Home page. Please always check your spam/junk box, as quite often this is where my reply ends up. Roll Call K-O. Sgt. Alfred O'Gorman. ​Roll Call P-T. Patrick Heneghan (see Herbert Roseby). The Chindit Society. Newsletter Spring 2019 and 3rd March Event. Roll Call P-T. CSM Thomas Thomson and Ronald Pike. ​Following 5 Column. New photographs of Tigyaing. ​Roll Call F-J. John Griffiths. ​Roll Call A-E. Richard Coates. ​Roll Call U-Z. Update Corporal John Usher. Burma Rifle Citations. Update Saw Chit Kyin and Aung Thin. Matron Agnes McGearey. New photographs. This website is dedicated to my Nan, Bella Howney, my Grandad, Arthur Leslie Howney and to all the men of the Chindit operation in 1943. My thanks go to all the Chindit families who have sent me their man's story or have learned about his time in Burma through this coming together of information and knowledge. My hope, apart from wanting these pages to be their special place, is hopefully to find more stories and Longcloth tales. But the keys are lost and twisted. Above is a small piece of the poem, 'Their Very Memory' by Edmund Blunden, which was used by Lieutenant Philip Stibbe in his book about his experiences in Burma as an original Chindit in 1943. It was his way of lamenting the lost and forgotten from that operation and honouring the men who in his view would never be written about or whose wartime pathway ever found. During the past eight years or so it has been my determination to search out their story and re-trace those long lost footprints. My inspiration for this project was my Nan. She like so many women back then had found herself widowed in WW2, but had fought hard to bring her young family through those difficult times. She succeeded and was the centre of our lives until she passed away in June 2006. I know in my heart that this relentless and near obsessional attempt to trace the men of the first Wingate operation is my way of staying connected to her memory and honouring her life, perhaps more than it is about finding out what happened to my Grandfather, or any of the other Chindits from that fateful year. This website concentrates not so much on the military actions of 1943 or the main leaders and players who directed the operation, but is about the extraordinary courage and stoicism of the humble soldiers involved. The idea has been in my head for a number of years now and has at last been put to the page. 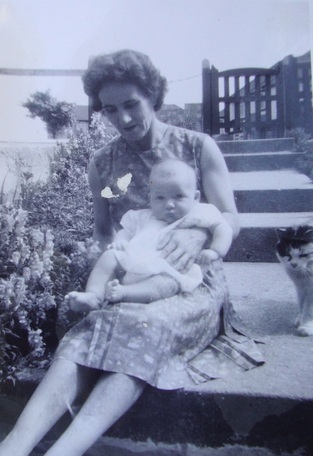 This is my Nan and me in 1964 on the front steps of our family home in Neasden, north west London. I have no idea of the cat's name. Only 18 years had passed by since she received the terrible news that her husband was never coming home from Burma. She never faltered in ensuring that her young family were cared for and brought up in a secure and loving home, something she carried forward into the lives of her grandchildren too. I suppose the question I would like to have the answer to, is how she felt about her own life, from her own personal perspective. But like so many families touched by the catastrophe of war, nothing much was ever spoken, for the fear of reviving too painful a memory. The intention of this website is to bring the men of Chindit 1 together in one place. The ethos of the site is to share with and inform the extended Chindit family and hopefully the wider audience too. My philosophy is to open out this information to all, but please do not abuse the spirit in which it is presented. Thank you. If you have some information to share or are a relative of a Longcloth Chindit, or simply want to ask a question, please do get in touch using the contact page below. NB. It is my intention to always answer any email sent via the contact page below. If you do not receive an answer then it is possible that my reply has gone into your spam box, this does seem to happen quite frequently in my experience. A sensible first step for any family trying to find out more about a soldiers WW2 service would be to apply for his Army Service Records from the M.O.D. offices in Glasgow. Here is a link to the Ministry of Defence website, showing details of how to apply for these documents. If you do not receive a response to any enquiry, please check your spam/junk box, as quite often this is where my reply seems to end up. Copyright © Steve Fogden November 2011.